Refugees Welcome Schools, Autumn 2018 – six schools sign for Refugees Welcome Schools accreditation. Redways Relaunch, Summer 2018 – won 261 specified improvements to the Redway network against target of 50. 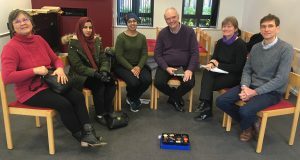 House the Homeless, Spring 2018 – agreed working with MK Homelessness Partnership; developing MK’s first Community Land Trust. Life Skills for Young People, Spring 2018 – won pledges from Santander and the Open University to delivery finance management skills training sessions in school. Mental Health, Spring 2018 – agreed working with the Director of MK Mental Health Services to improve services. Living Wage, Autumn 2017: 48 MK employers accredited with Living Wage Foundation. Fight Against Hate, Autumn 2017: pledges from Thames Valley Police and MK Council at Fight Against Hate Day of Action. Redways Relaunch, Summer 2017: four employers (Dentons Network Rail, Santander, Shoosmiths) partner schools in clearing and cleaning local Redways. Fight Against Hate, Summer 2017: 10 hate crime survivors have their voices heard at first ‘Healing through Hearing’ event. Redways Relaunch, Summer 2017: Leader of MK Council pledges to 50 Redway improvements. Mental Health, Spring 2017: Director of MK Mental Health Services pledges to support campaign goals. Fight Against Hate, Spring 2017: General Manager of Arriva Buses (Midlands) pledges to run poster campaign on buses in national Hate Crime Awareness Week. Living Wage, Spring 2017: 40th MK employer says yes to real Living Wage accreditation. 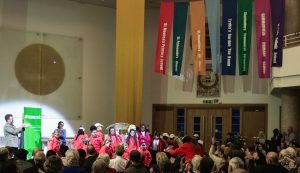 Weaving Trust, Winter 2017: 50 organisations involved in single event at Cornerstone Church to begin MK 50 celebrations. Refugees Welcome, Autumn 2016: three more Syrian refugee families settled in MK. Weaving Trust, Summer 2016: MK Council’s 2016-20 Council Plan includes: ‘Support the development of an agreed set of proposals each year with Citizens:mk to be proposed at their annual assembly’. Community Energy, Summer 2016: Council Leader appoints Cabinet member and Director with responsibility for reducing energy use. Refugees Welcome, Spring 2016: two Syrian refugee families settled; leaders of three main parties commit to Autumn talks about increasing refugees welcomed. Weaving Trust, Spring 2016: 35 organisations (of target 50) pledge to attend ‘MK50’ Weaving Trust event in January 2017. Living Wage, Spring 2016: Business leaders pledge commitment to achieving goal of 50 accredited MK employers in 2017. Community Energy, Spring 2016: Council Leader pledges commitment to installing solar panels on Council buildings. Safe Youth, Spring 2016: Council Leader appoints officer to enforce parking restrictions at Southwood Primary School. 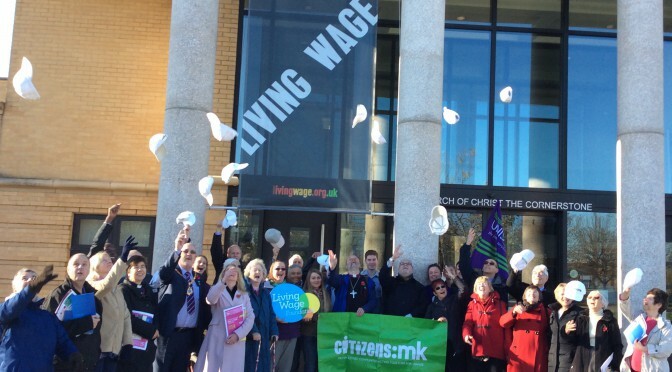 Living Wage, Winter 2015: launch of MK Living Wage Business Network, a UK first; 14th MK-based employer accredited. Refugees Welcome, Autumn 2015: Refugees Welcome campaign launches with assembly of 100+ from 12 institutions, including MK Council. Fair Transport, Summer 2015: Bus Passengers Charter approved by MK Council and bus companies. Safe Youth, Spring 2015: new accommodation found at The Buszy for Q:alliance youth groups’ weekly meetings. Weaving Trust, Spring 2015: first event facilitating speed conversations between people from different institutions. Fair Transport, Winter 2015: bus subsidies preserved in MK Council’s budget. Living Wage, Autumn 2014: MK Council registers for Living Wage accreditation. Living Wage, Autumn 2013: The Open University registers for Living Wage accreditation. Safe Youth, Spring 2013: unsafe redway path near MK Academy school made safe by Parks Trust. Safe Youth, Winter 2012: first community walk held, addressing issue of youth violence on Fishermead, launch of ‘CitySafe’ campaign.